The "Minor Day of Atonement"; observed on the day preceding each Rosh Ḥodesh or New-Moon Day, the observance consisting of fasting and supplication, but being much less rigorous than that of Yom Kippur proper. The custom is of comparatively recent origin and is not mentioned in the Shulḥan 'Aruk. It appears to have been inaugurated in the sixteenth century at Safed by the cabalist Moses Cordovero (Da Silva, "Peri Ḥadash," Rosh Ḥodesh, § 417), who called the fast "Yom Kippur Ḳaṭan"; and it was included by Isaac Luria in his "Seder ha-Tefillah." R. Isaiah Horowitz refers to it by that name, and says it should be observed by fasting and repentance: "Following the custom of the very pious, one must repent of his ways and make restitutions both in money and in personal acts, in order that he may enter the new month as pure as a new-born infant" ("Shelah," ed. Amsterdam, 1698, pp. 120b, 140a, 179a). When Rosh Ḥodesh occurs on a Sabbath or Sunday, Yom Kippur Ḳaṭan is observed on the preceding Thursday. The fasting is not obligatory, and only the very pious observe that act of self-denial. The liturgy of the day, which consists of seliḥot, is recited at the Minḥah prayer in the afternoon. Ṭallit and tefillin are adjusted, and if there are among the congregation ten persons who have fasted, they read from the scroll "Wa-Yeḥal" (Ex. xxxii. 11 et seq.). The seliḥot are taken partly from the collection used on the general fast-days and Yom Kippur, with the "Widdui ha-Gadol" (the great confession of sin by Rabbenu Nissim) and "Ashamnu," and also a beautiful poem written for the occasion by Leon of Modena and beginning with "Yom zeh." Some congregations add "Abinu Malkenu." The fast ends with the Minḥah prayer. For the text see Baer, "'Abodat Yisrael," pp. 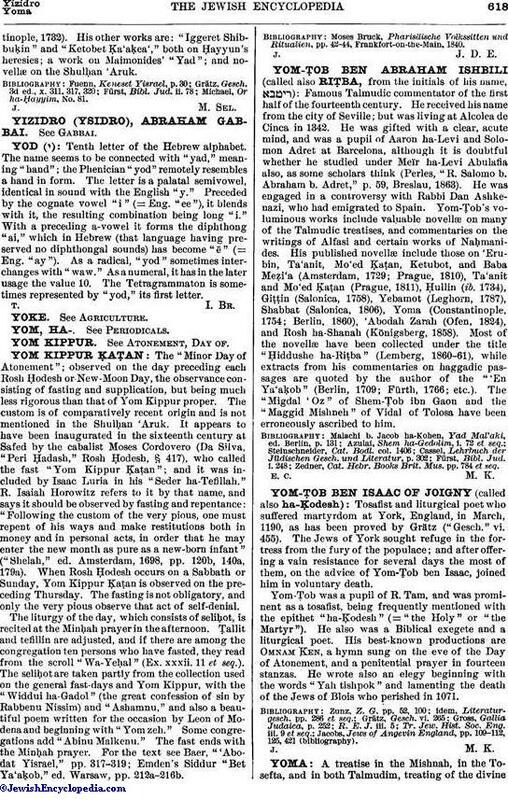 317-319; Emden's Siddur "Bet Ya'aḳob," ed. Warsaw, pp. 212a-216b. Moses Bruck, Pharisäische Volkssitten und Ritualien, pp. 42-44, Frankfort-on-the-Main, 1840.